Blogs, YouTube, Facebook, Twitter, Google+, and other platforms are giving everyone a "voice," including organizations and their customers. So how do you create the stories, videos, and blog posts that cultivate fans, arouse passion for your products or services, and ignite your business? Content Rules equips you for online success as a one-stop source on the art and science of developing content that people care about. This coverage is interwoven with case studies of companies successfully spreading their ideas online--and using them to establish credibility and build a loyal customer base. 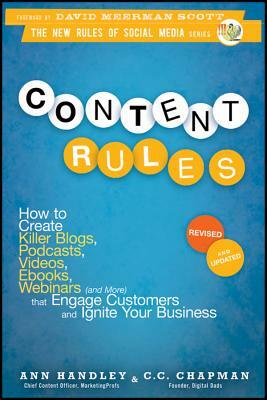 Boost your online presence and engage with customers and prospects like never before with Content Rules. Ann Handley is the Chief Content Officer of MarketingProfs, a training and education company with the largest community of marketers in its category, and co-founded ClickZ.com. She is a monthly columnist for Entrepreneur magazine, a contributor to LinkedIn's Influencer program, and Amex's OPEN Forum. There's nothing more fun than following her on Twitter, where she has 170,000 followers, or subscribing to her own site at AnnHandley.com. C.C. Chapman is a media creator, entrepreneur, keynote speaker, and online marketing consultant. He is the founder of DigitalDads.com and the host of PassionHit.tv. For more information, please visit cc-chapman.com.